After graduating college in 2012, Jess Bettencourt decided she was going to get in shape and take control of her postgrad health. 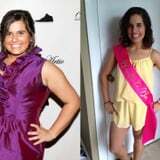 Fast forward a few years, and Jess is down 50 pounds - and she's sustained her weight loss! By combining two of the most popular women's weight-loss programs, Tone It Up and BBG, she's become stronger both physically and mentally. Here are her tips, tricks, secrets, and integral parts of her journey to her best self. Jess Bettencourt: When I graduated from college, I was at my heaviest weight ever and felt so down about myself. Clothes weren't fitting the way I wanted them to and one of the breaking points was hearing my doctor recommend I diet and exercise at my annual physical. I knew it was time for a change as I began a new chapter in my postcollege life. When I entered the "real world," I quickly noticed that most of my time was spent at my desk, snacking and eating foods that had little to no nutritional value. It was only a few weeks into my first job out of college in 2012 that I decided to begin working out and eating healthier foods. I began by following Workouts from Tone It Up, which then led me to mix it up with Kayla Itsines's program (and now Lauren Gleisberg); I even started a fitness Instagram to connect with like-minded women going through similar situations. Slowly, I became more energized and confident in myself, and this all resulted in a significantly improved home and work life. PS: What drew you to TIU and BBG specifically? JB: At first, Tone It Up caught my eye due to its convenience (a lot of workouts are free and right on YouTube) and the sense of community on social media (#TIUteam), and also I really loved the trainers, Karena and Katrina. Then, my body quickly adjusted to those workouts, so I was looking for my next challenge to continue seeing results, which led me to Kayla Itsines's Bikini Body Guide (BBG). "Slowly, I became more energized and confident in myself, and this all resulted in a significantly improved home and work life." Those workouts were hard, but took less than 30 minutes, and I really built a lot of my strength through Kayla's tough, effective circuits. I completed more than 24 weeks of BBG and, again, my body needed something new - so now I am working on completing Lauren Gleisberg's weight-training plans. Each fitness program has such a dedicated following on social media, which really helps keep me accountable, even on my laziest of days! JB: Lately, I've been obsessed with Peloton classes - so much so that my husband and I purchased a Peloton bike for our own home gym (thanks, Kenny!). I like to take a short 20-minute class, then follow it up with a weight-training workout from Lauren Gleisberg either before or after. I'm getting a quick cardio session in but also focusing on a muscle group as well. I also like to be in the comfort of my own home gym - which originally started with just a set of eight-pound dumbbells - and play my music as loud as I want and film some of my workouts to ensure proper form. JB: I exercise about five days per week. I try to work out before the work day begins (roughly around 6:30-7:30 a.m.) because it wakes me up and prepares me for the workday ahead more than a cup of coffee could. However, if I do sleep in, I don't beat myself up about it - I just make sure to get it done in the afternoon or over the weekend. It's all about being flexible but still getting it in! JB: I'm all about mixing up my workouts and listening to what my body is craving that day. I combine quick weightlifting workouts from Lauren Gleisberg, toning exercises from Studio Tone It Up, Peloton bike rides, and, when the weather permits, an outdoor run for some cardio. Having a great playlist handy also helps keep my workouts fun and exciting! JB: Overall, I've lost - and kept off - 50 pounds since 2012. I've also gone from obsessing over the number on the scale to not weighing myself at all. JB: Fitting into some of my favorite old clothes and trying on some of my usual (now larger) clothes and seeing them swim on me made me really proud of myself. One of the proudest moments of my entire journey was also slipping into my wedding dress in 2016 and feeling as confident as ever in a tight, mermaid-style dress of my dreams. I kept looking in the mirror thinking "There's no way that's me?!?" It was! The hard work paid off! JB: I don't step on the scale anymore now that I've lost the weight I wanted to. I am also trying to build more muscle now, which can alter the scale and scare you. Instead, I like to track my progress through before and after photos, seeing how my clothes fit, and noticing myself getting stronger during workouts that I once thought were impossible. JB: I like to eat five meals a day, spread out so I'm eating every two to three hours or so during active hours. JB: I don't count my calories because when I used to, it became an unhealthy obsession. Instead of tracking calories, I focus on intuitive eating - I know when I'm hungry and how to fuel my body. I try to eat something every two to three hours and stick to whole foods with greater nutritional value. I'm also a big fan of recipes from bloggers like Skinnytaste - full of flavor, yet I know my meal will be light on calories. JB: My fridge is always stocked with unsweetened almond milk, ripe avocados, salad fixings (I mix them up so I don't get bored - one week will be baby kale mix, another week spinach and spring mix, etc. ), Ezekiel bread, fresh fruits, and lots of fresh veggies like brussels sprouts, asparagus, and broccoli. My freezer is stocked with frozen fruits, lean proteins, and the occasional Halo Top ice cream for a treat during the week. JB: During the workweek, I pack my lunches as much as I can. That way, if I do happen to go out for a meal over the weekend, I know that I've been eating clean and it's OK to order off the menu. I also like to scope out the menu before I make reservations at a restaurant so I can plan what I'm eating ahead of time; this helps avoid any last-minute decisions based on impulse cravings alone. "Be patient and continue showing up, day in and day out." JB: I use a Fitbit Charge 2 and it helps me track my water intake (I try for 100 ounces each day) as well as my activity level. On rest days, for instance, I try to make sure I at least have 10,000 steps - which is pretty doable when you have an active dog at home - so I know I've had enough movement for the day. PS: What role did TIU and BBG play in your journey? Would you recommend them? JB: Tone It Up really introduced me to a balanced lifestyle. Through this program, I learned how to eat effectively (this is where I learned about my five meals a day, for instance) and understand that workouts don't have to be boring or always so brutal. It was such a welcoming community, too, and I would highly recommend it to anyone at any stage of their fitness journeys. I would also recommend Kayla Itsines's BBG program to anyone who wants a new challenge and is tight on time for workouts - in less than 30 minutes, you'll be drenched in sweat and feeling so strong. JB: The best advice on a weight-loss journey is to be patient and continue showing up, day in and day out. When I first started my journey, I expected to see major results in just days, and when I didn't, I was upset. However, I didn't give up - I just continued trying, and the results then came afterward. The days and weeks will pass by anyway, so why not make them count? Try your best and understand that some days will be harder than others - just don't give up completely. Weight loss is one of the hardest, most stressful journeys one can go on, but it's truly a lifestyle, and you just have to find what works best for you throughout all aspects of life.